Tea Tree Oil, 1 fl oz / 30 ml (Desert Essence) - Penn Herb Co. Ltd. 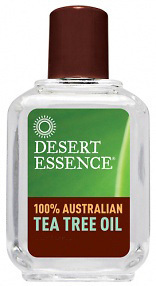 Tea Tree essential oil from eastern Australian is an abundant source for maintaining healthy, glowing skin. Its inherent antiseptic qualities make it suitable for everything from skin care, household cleansing to a therapeutic pedicure treatment. 100% Pure Australian Tea Tree Oil (Melaleuca Alternifolia). Effectively treats problem skin with regular use; deep-cleans pores and helps relieve redness; pedicure treatment; minor skin irritations. Add 1 or 2 drops to a moist cotton pad for application to appropriate skin areas. WARNINGS: Do not use full strength on skin. Dilute with water or carrier oil and then test a small amount against clean skin on forearm 24 hours prior to use. For external use only.